Wood Stove Replacement Glass- What Kind Do I Need? If you’re looking to replace your wood stove glass, either because it has cracked or shattered, or just because of impossible-to-clean residue or build-up, it’s important you order the right kind of glass to install in your wood stove. 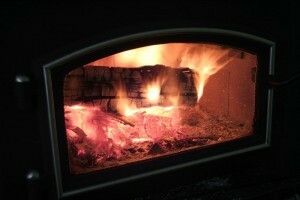 Wood Stove Fires Burn at High Temperatures – What kind of glass do I need for a wood stove? Heat inside a wood stove can reach temperatures upwards of around 1100 to 1200 degrees Fahrenheit. These high heat levels require a special kind of material that can withstand extreme temperature changes without cracking or shattering. Ceramic glass is not actually glass, but a clear, ceramic polycrystalline material which has the ability to withstand the extreme temperatures produced inside a wood stove. Ceramic glass should always be used for wood stove applications and where heat levels of the glass may exceed 500 degrees Fahrenheit. Heat resistant ceramic glass is less likely to shatter with sudden temperature changes than tempered glass. Tempered glass is a less-expensive alternative for some fireplace applications where fires will be more than 6” from the glass, but for safety reasons, tempered glass should never be used for wood stoves. One Day Glass offers two brands of ceramic glass for wood stove and fireplace applications. PyroCeram® is 3mm thick and can withstand temperatures up to 1256 degrees Fahrenheit, while our NeoCeram® is 5mm thick, withstanding temperatures up to 1470 degrees. Can I Install My Own Ceramic Woodstove Glass? Yes! In fact, it’s incredibly easy to order custom ceramic glass and install yourself. For pricing and ordering information, click here or call us today!